Do you want better results for your members? Summer is just around the corner, and there’s no better time to make sure your members are getting the best from your rigorous training program than RIGHT NOW! 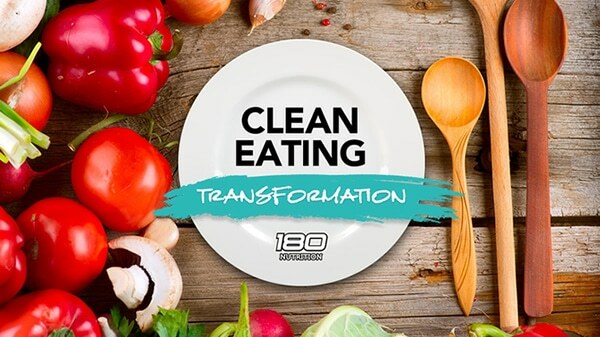 The 180 Nutrition Clean Eating Program is aimed at members of personal training studios, gyms and CrossFit members who consistently smash their bodies in the gym and want to make the most of every single lift and chin up both post-workout and during recovery. Created to give your members accurate nutrition advice and by providing a holistic overview to their existing exercise program, the 180 Nutrition 30-day Clean Eating Digital Program will significantly improve their results, starting immediately. Our mission is to bring wellness to millions and dispel the myths that circulate the industry regarding nutrition, recovery and overall quality of life. We are committed to helping people do this by aligning ourselves with like-minded organisations and working together to provide a complete overview of health and nutrition. We cover topics such as counting calories, exercise for weight loss and discuss the so-called ‘health foods’ that could be holding you back. With 15-years of collective experience in the health and nutrition industry; Guy and Stu are well versed on how good nutrition and a diet filled with nourishing whole foods can improve recovery to help build muscle, lose weight and reduce inflammation to help you train harder. Guy and Stu have connected with some of the most influential leaders in the health and wellness industry and with their podcast ‘The Health Sessions’ consistently sitting at number one on the iTunes chart and exceeding over 1 million downloads; their knowledge is invaluable. The Clean Eating Digital program simplifies the confusing information and makes it easy for your members to apply a nutritious balanced diet in conjunction with their training. Access to a private Facebook group: Join our community of like-minded members where we answer your questions in a private group environment. This group is very supportive with great member interaction and expert advice given to further improve the results of your members. Weekly emails: Our resident nutritionist, Angela will provide regular tips, information and advice and motivation on sticking to a nutritional plan. To compliment the program, each member has the option of purchasing a 1.5kg bag of 180 Natural Protein Superfood during the introductory workshop. This Superfood product is made from completely natural, wholefood ingredients and helps to remove bad food choices which ensure each member has easy access to a healthy nutritious alternative. We are taking bookings for the Clean Eating workshop for a limited time only so the sooner you book in; the sooner your members will start to see amazing results. It is your name that is associated with their performance so let’s work together to help them make the most of their training, both in and out of the gym. 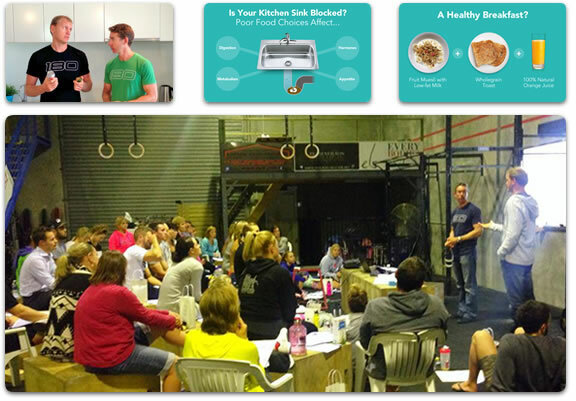 CLICK HERE to request more details about our Clean Eating Transformation Workshops and make an immediate start on enhancing the performance of your members. “When we decided to run our 30 day program we wanted to align ourselves with like-minded people who have a passion for health, especially long term health. Guy and Stu delivered a message that was simple, clear and achievable, giving our members motivation to make nutritional changes. The Clean Eating Online Program has also been an excellent resource for our members from getting started through to recipes and videos from experts in the field. 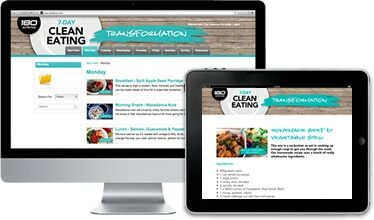 We highly recommend the guys from 180 Nutrition and the Clean Eating Online Program”.